Jarrett Gilgore is a multi-instrumentalist, teacher, composer, improviser residing in Baltimore, Maryland. He specializes in the saxophone and also teaches clarinet. He performs actively in the U.S.A. and internationally in a wide variety of contexts. Jarrett received his Bachelors of Music from the Peabody Institute of the Johns Hopkins University with a concentration in Jazz Saxophone Performance. He teaches beginners through advanced students, and he specializes in jazz and improvisation. 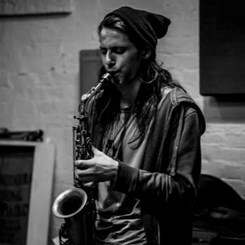 He has diverse professional experience performing jazz, funk, rock, indie, folk, avant-garde, and pop music, and he has professional experience composing and arranging for different projects and artists. He has performed/recorded with Dan Deacon, Cass McCombs, Anna & Elizabeth, Rubblebucket, Lonnie Holley, Tony Malaby, Michael Formanek, Susan Alcorn, Wildhoney. He has toured around the world performing at festivals and venues including Artscape Festival, Savannah Music Festival, Pier 6, Burlington Jazz Festival, Undead Music Festival, Landmark Festival, de Ruimte, Zaal 100, Firehouse 12. Request Lessons with JARRETT today!